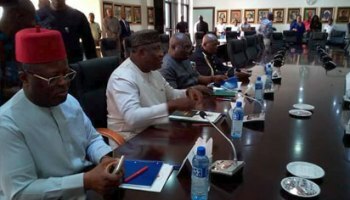 We the family members of the Indigenous People of Biafra (IPOB) and it's leadership worldwide under the command of Mazi Nnamdi Kanu wish to bring to the attention of Biafrans and the entire world the purported thank you visit to Aso Rock by South East governors and Nnia Nwodo in the company of 28 compromised Igbo leaders scheduled for tomorrow October, 13. IPOB has learnt that this meeting tomorrow in Abuja was at the instigation of the Presidency to thank Ohaneze Ndigbo and Igbo political leaders for their support in the brutal crackdown and killing of unarmed IPOB members. They will also toast to what they erroneously think is a 'successful' suppression of IPOB activities. This assumption that IPOB structures have been dismantled is not only foolish but unfounded because we are still holding our meetings and strategising to shut down Anambra State on 18 November 2017; the very day the world will know how dominant IPOB ideology is across Biafraland. It is now obvious that Ohaneze Ndigbo, along with Igbo governors, is now involved in creating new and novel ways for Hausa Fulani dominated Nigerian Army to kill unarmed members of IPOB and civilians in Biafraland, particularly in South Eastern states. As Nnia Nwodo, South East governors and few Igbo efulefus are planning a victory party over the death and destruction of unarmed IPOB members tomorrow being 13th October 2017 in Aso villa Abuja, a list of the finest selection of saboteurs Igboland has been selected to attend this event. One Ohaneze chieftain described the gathering tomorrow in Abuja as the 'requiem mass' or funeral ceremony of IPOB and Nnamdi Kanu. President Muhammadu Buhari has promised these Igbo sellouts in Ohaneze 8 major FG appointments and the family of Nwodo stands to get at least two. It's an abomination that Igbo governors and Ohaneze Ndigbo had to sacrifice the blood of 81 young men and women just to gain the promise of 8 FG appointments, which hasn't even been confirmed yet. Afenifere and Arewa North will never trade the blood of their people for political appointments but Nwodo and Igbo political gangsters will not only sacrifice the blood of the living but stand ready to mortgage the fate of future generations just to feather their political nests. Sadly this sabo dance of shame that will take place in Abuja tomorrow is only unique to Ohaneze Ndigbo and Igbo political class. These traitors in our land will be shocked to know how IPOB intelligence unit uncovered their treacherous plan to celebrate the death of their own people at the hands of the same Hausa Fulani Islamic caliphate that is responsible for their pitiable plight in Nigeria today. It is the responsibility of this IPOB generation to put an end to this disgraceful politics of compromise and turncoats that have characterised the political landscape in Biafraland since after the war. The likes of Nnia Nwodo and South East governors must be made to wear their slave status to Arewa North with pride. Their years of pretense and lies have come to an abrupt end. They must proudly answer to the agents of the North which they truly are. Nnia Nwodo and Ohaneze have completed the enslavement of our land for Hausa Fulani caliphate. IPOB must stop them now or they will kill all of us in the name of preserving Arewa owned One Nigeria.